Cuzco posed like a statue for a very long time, just waiting for me to bring the camera I’m sure. 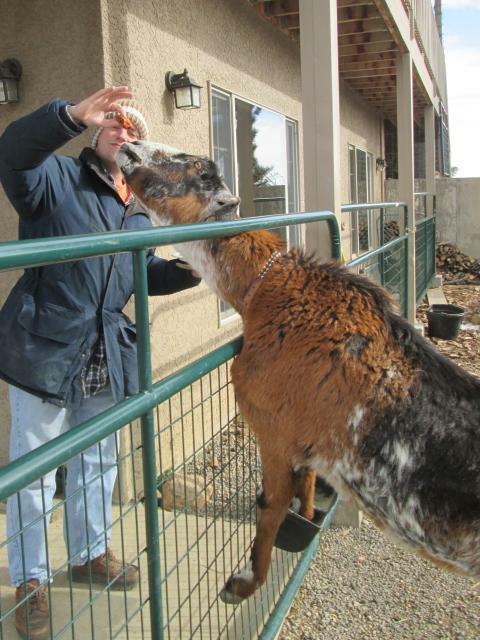 And then the old goat did something very out of character–he pulled a silly face! 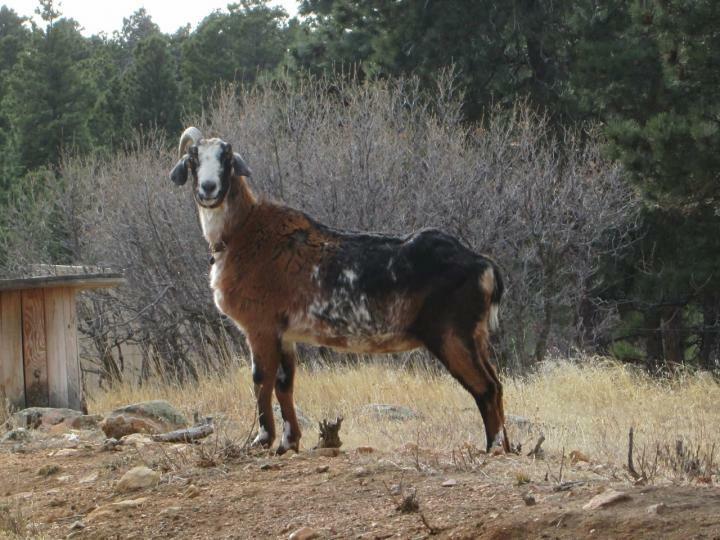 I’m used to the other goats making goofy expressions and sticking their tongues out at the camera, but never Cuzco! 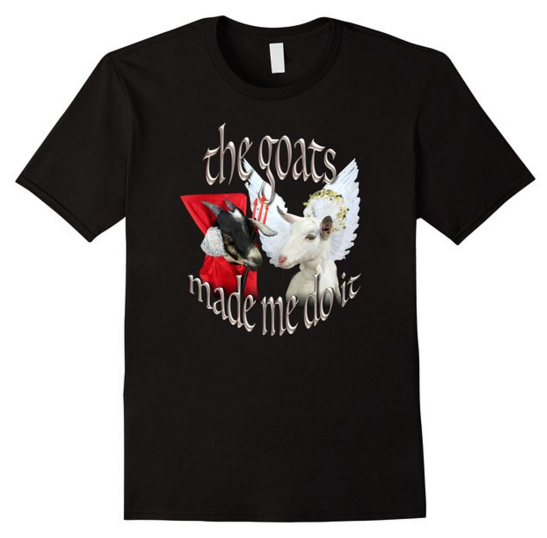 I guess even the most dignified goat has to let his hair down once in a while. 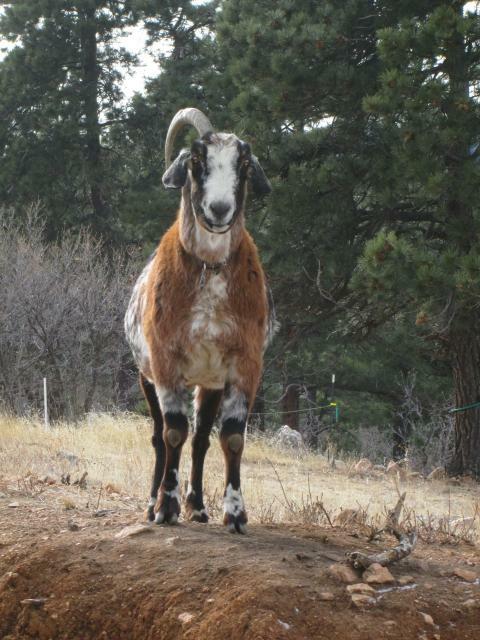 Have I ever mentioned that fruitcake very nearly killed this greedy goat two years ago? We bought a 3-lb. fruitcake that was supposed to be shared among five goats. Cuzco tore into it like a fiend, knocked it to the ground and devoured it before anyone had time to react. I got a picture of the aftermath. And this was where Cuzco spent the next day. We ran him into the vet that morning because he was so sick he would hardly move, but the vet didn’t seem to think there was much to be done for him. 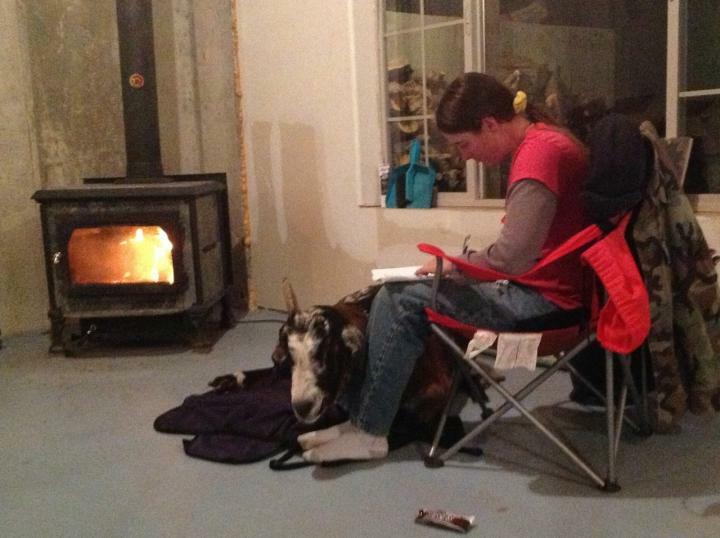 So we took him back home, made him a bed by the wood stove, and I sat with him until late that evening when he finally got up and wanted outside. It was a few days before he was totally “right”, but he pulled through and we’ve since modified our fruitcake distribution system. For one thing, you’ll notice there is a gate between Phil and Cuzco in this year’s picture. We also bought a smaller fruitcake which was then cut into even smaller portions to be fed one at a time. 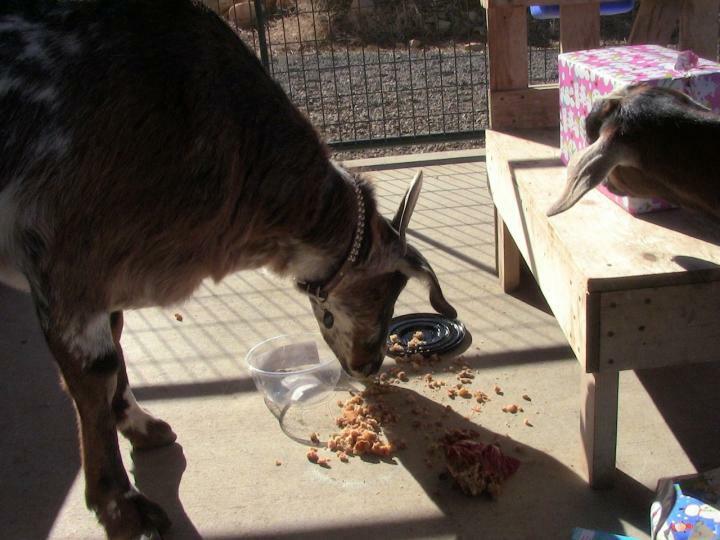 Cuzco still got the biggest portion because he by far enjoys it the most (only about half of the goats even like it at all), but we make sure he never gets to inhale an entire 3-lb. fruitcake in one sitting again! Although we are not Beulah natives, because of our unusual companions we managed to get showcased in the Channel 13 news report on the Yule Log Festival. 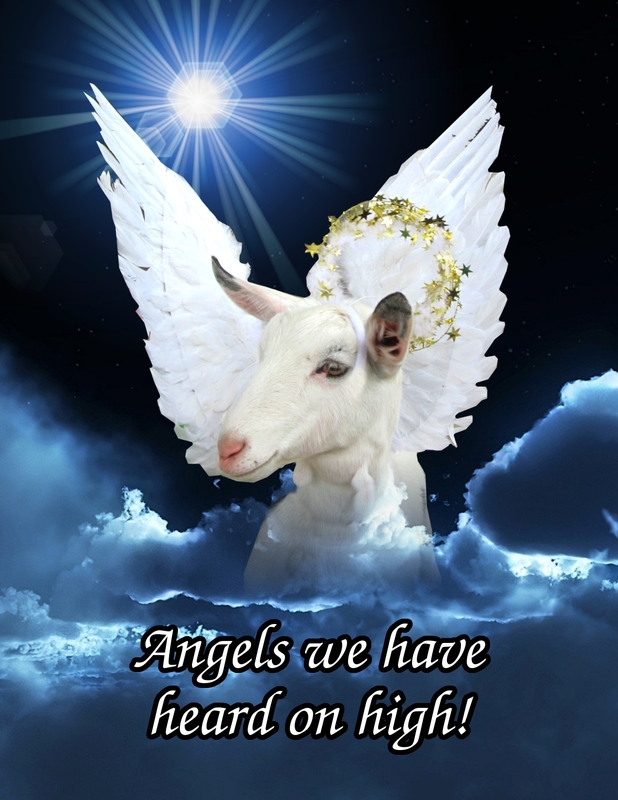 Way to go, goats! The snowstorm ended early on Saturday night and Sunday dawned clear and warm with a few inches of dazzling powder to make everything fresh–except the road. The dirt road we take to Beulah was pure mud. But at least it was no longer icy and the visibility was good. 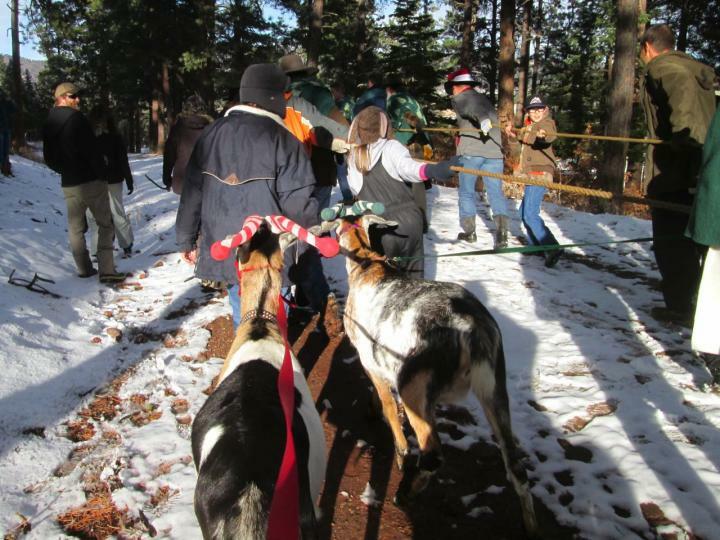 So we loaded up Finn and Sputnik and splashed our way back over for the highlight of our Christmas season–the annual Beulah Yule Log Festival. As a safety precaution and as a fun way to celebrate the festive season, Phil and I wrapped our boys’ horns in candy-cane stripes. Now that they know what we’re up to, they’ve both gotten very patient and good about this procedure. The event started off with readings, blessings, and Christmas carols. There was a special “Blessing for the Animals” which particularly warmed my heart. There was a perfect place for goats to hang out during this more solemn part of the festival. There is a substantial rock outcropping near the side entrance to the pavilion, and this year it was covered in evergreen boughs, so Finn and Sputnik were able to entertain themselves by climbing and nibbling until the Hunt began. After the service, the hunt for the Yule Log began! With a bugle fanfare, the Huntsmen, all dressed in festive green shoulder capes, led us to the general vicinity of the Yule Log, told us the boundaries within which it was hidden, and let us go! Finn and Sputnik took off like hound dogs, plunging into the woods with Phil and I dragging at the end of their leads. 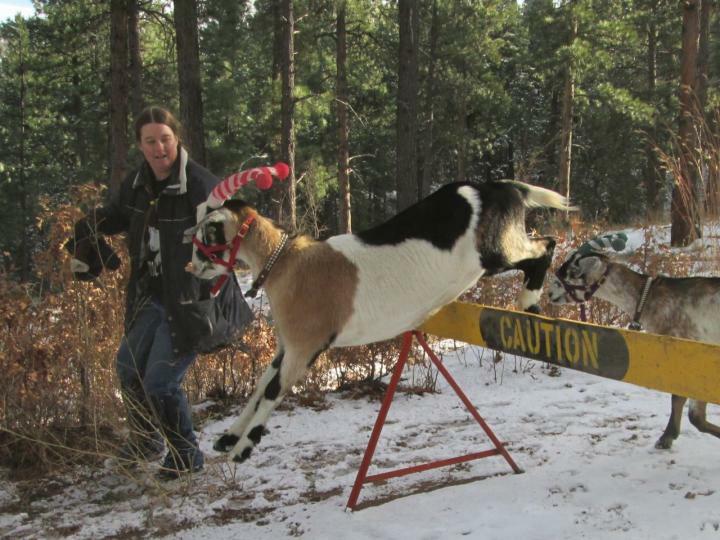 But as usual, and despite their overwhelming confidence, goats seem to be no good at Yule Log hunting. They ended up leading us far out of bounds. But we had a lot of fun playing with the boundary line. I tried to get them to jump it in unison, but that only happened once–naturally it was before Phil had the camera ready. It was a pretty high obstacle, so it was really fun to watch them sail gracefully over it. It was about this time that we heard someone cry “Haleub!” This is “Beulah” spelled backwards, and it marks the discovery of the Yule Log. We hastened down the hill toward the excitement as a Huntsman sounded a bugle to gather the scattered crowd back together. 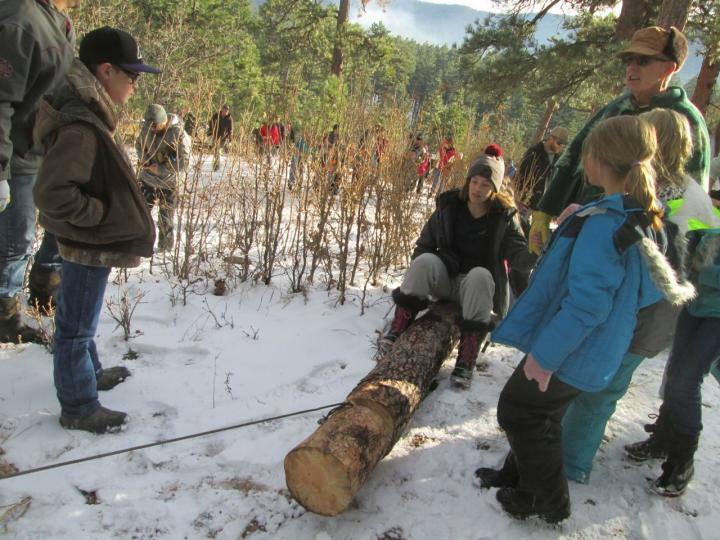 The lucky finder of the Yule Log gets to ride it back to camp while the not-so-lucky revelers get to drag it. 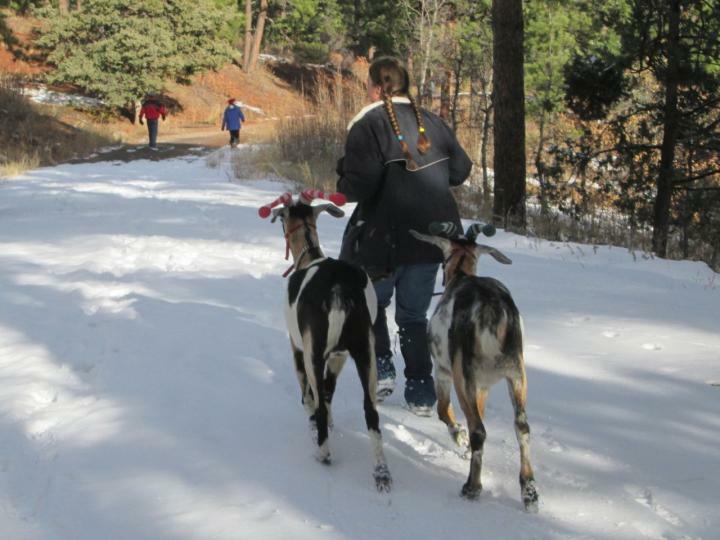 We tied the goats’ leashes to the rope so they could help us pull too. 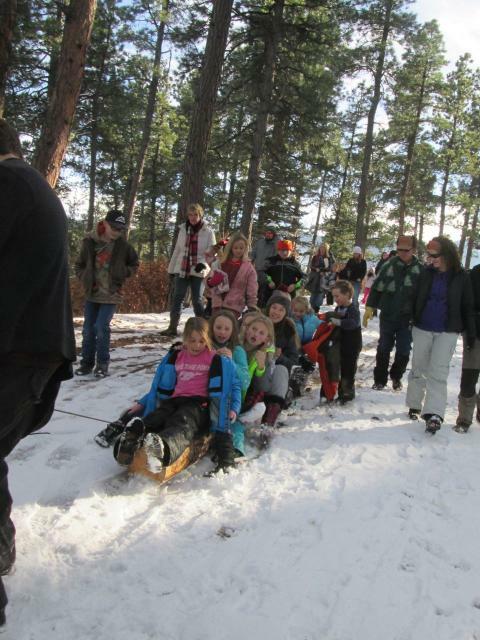 It didn’t take long for the lucky winner to invite all of her friends to ride the log with her. This Yule Log got pretty heavy after a while! Finn made good friends with this Huntsman by the time we were done dragging the log back. After the log was dragged back, it was sawn in two and one half was put on the Yule fire and the other half will be saved to start next year’s fire. And then there was wassail and cookies! We had to tie the goats up while we got the cookies because I was afraid that if we took them with us down the line there might not be any left for the folks behind us. They were very unhappy with this arrangement and Finn kept trying to climb over the fence. But there were many cookies left over after everyone had been served, so I was able to snag a generous handful for them. Ginger cookies were a particular favorite. 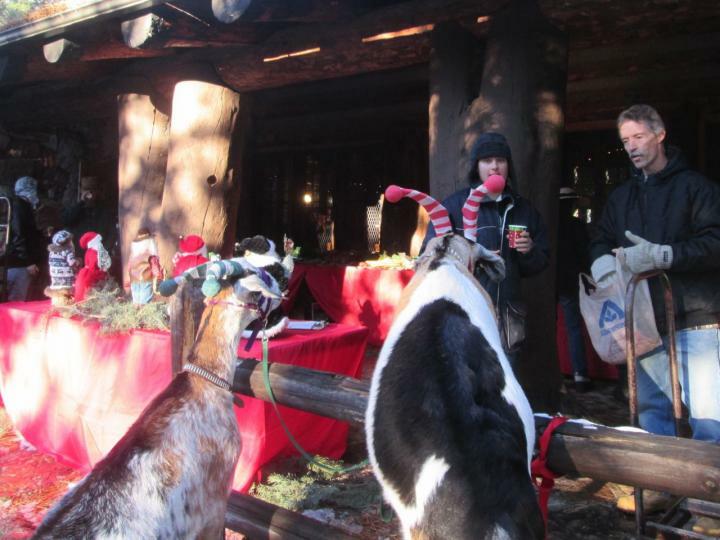 There were also folks in the crowd who shared cookies as well, so between all of us I think the goats got their fair share of Christmas cheer. A Snowstorm Can’t Stop Us! It was an exciting weekend at Goat-O-Rama! Saturday night Beulah had their annual Parade of Lights, and Old Man Winter was in full attendance this year. Some thought we might not make it because of the snowstorm, but we weren’t going to be daunted by a few snowflakes! We did, however, leave the cart at home. We figured the roads would be too icy to use it safely. We blanketed Cuzco and covered the door of our portable hutch so he would stay dry for the ride over. Once there, we loaded him down with packsaddle and festive red panniers filled with candy and then covered him from head to toe in colorful LED lights. He was a lovely sight to see! Of course, the first thing Cuzco did when I plopped a pannier full of chocolate onto his saddle was to turn himself inside-out trying to reach it. He went all the way down on one knee in his effort to get his teeth into those sweets, but I managed to get him back up and straighten him out before he grabbed anything. As a consolation, I did give him a few pieces of chocolate (properly unwrapped!) that were left over after the parade. Cuzco loves chocolate! We forgot to bring the camera, so I have no pictures of Cuzco decked out for the parade. Phil dressed as Santa and handed candy out to the kids. Well… I say handed. It took a little while for Phil to get his technique down. He started off by tossing candy, but after beaning a few people in the head, and watching others scramble around in the fresh powder to look for their fallen prizes, he changed his approach and started giving people candy by hand. A particularly special moment was when Santa Claus and his special Yule Goat walked up to a little girl and gave her a handful of candy. We saw the girl’s grandmother next day at the Yule Log Festival and she said it made her granddaughter’s evening. It turned out to be a very good thing we did not have the cart. The road was almost skating rink slick. Phil and Cuzco and I were the only ones walking in the parade–everyone else had a float. So the parade went rather fast for us and I had a hard time making Cuzco keep up on the slippery footing. He quite understandably wanted to take it slow, but we almost had to trot for much of the parade route. I was tired by the end. There was one tricky spot in the parade, however, which made us very grateful to be on foot! The route plunges down a steep hill with a sharp turn at the bottom, and several of the floats began to slide and got jackknifed at the turn. There was a bit of a pileup which we were happily able to avoid. All the trucks and trailers came away unscathed, but it was an exciting little stretch of roadway for a while. For such a small town, Beulah has a very respectable Parade of Lights with a large variety of very impressive floats. It think there are more people who ride in that parade than who watch it! Come see us in Beulah! 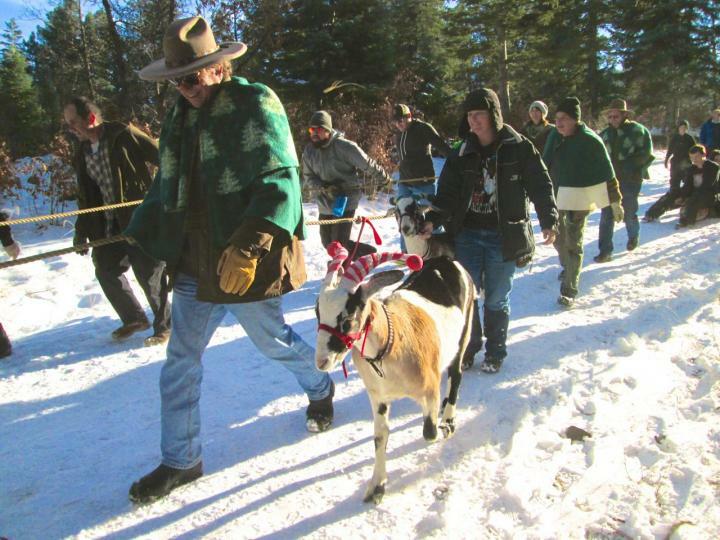 For those of you following this blog, Goat-O-Rama will be attending the Beulah Parade of Lights this evening in Beulah at 5:15. 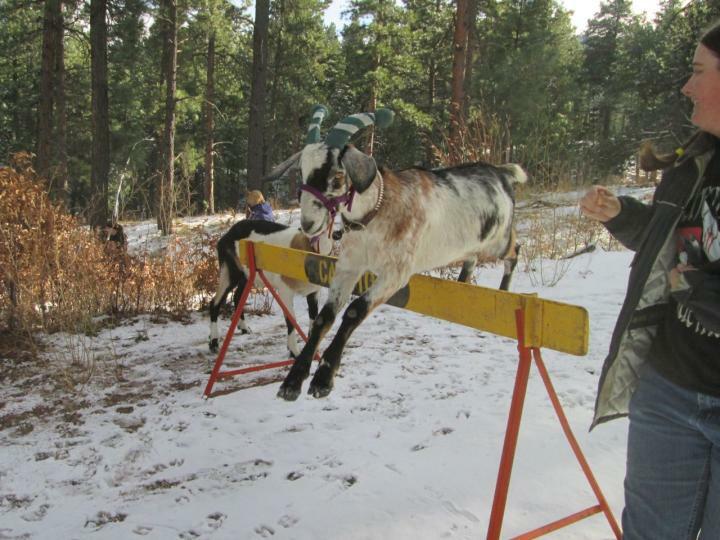 Santa will be making an appearance with his famous prancing Yule Goat, Cuzco. 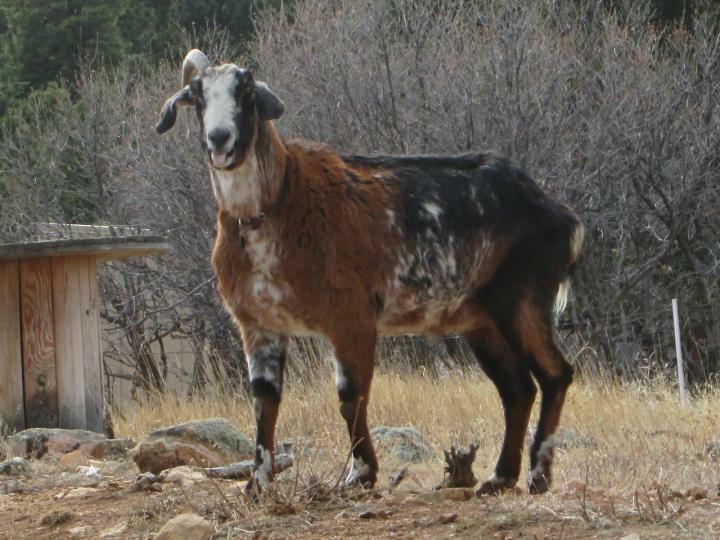 And tomorrow we will be attending the Beulah Yule Log Festival at 1:00 in the Beulah Mountain Park with two of our younger goats. Last year we took Snickers and Sputnik. This year it will probably be Sputnik and Finn. We hope to see you there!